Update: One year after a huge landslide erased a quarter-mile section of California’s Highway 1, the affected stretch of road has been reconstructed and is now reopened. Travelers can once again drive the coastal highway from San Diego to San Francisco, uninterrupted. Read more here. If heaven was a place on Earth, we think it’d look like Big Sur—a stretch of rugged coastline in Central California’s Monterey Country, known for its breathtaking vistas, tight-knit local community, expansive forests, and stunning cliffside resorts. But Big Sur, magical and remote, was threatened by the Soberanes Fire in 2016, which burned more than 130,000 acres and left the area particularly susceptible when the next winter season brought heavy rains. On May 20, 2017, a mudslide covered a large portion of Highway 1, destroying the Pfeiffer Canyon Bridge, adding 13 acres to the coastline, and effectively cutting off the small enclave from the rest of the world. After almost five months, Highway 1 is once again open, and a new Pfeiffer Canyon Bridge connects Big Sur to the rest of California, so it’s time to re-explore this central coast community. Take 48 hours and follow our guide for where to eat and stay, and what to do and see. 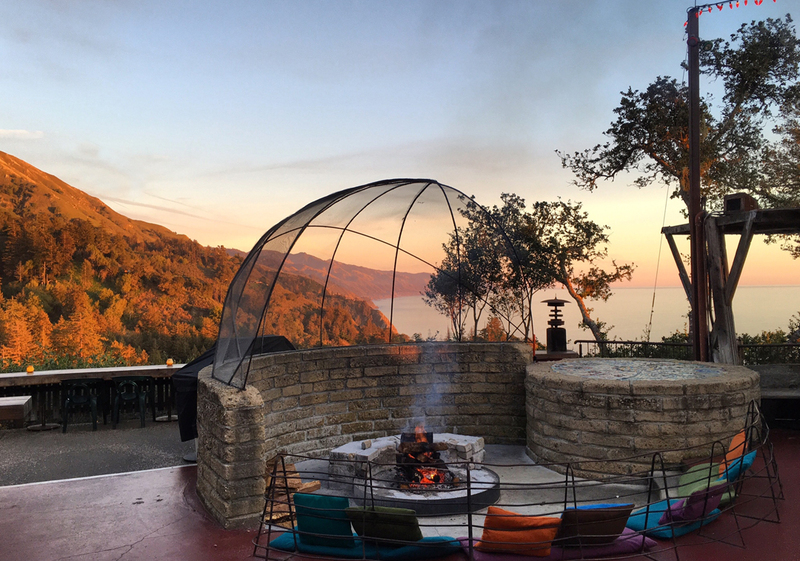 For the ultimate Big Sur experience, look no further than Post Ranch Inn, a five-star property dramatically perched on a cliff overlooking the California coastline and Pacific Ocean. All stays include complimentary activities such as yoga classes, nature walks, and stargazing as well as daily breakfast and use of the hotel’s fleet of Lexus vehicles. Post Ranch Inn boasts one-of-a-kind features including cliffside infinity pools, an award-winning spa set in the forest, and treehouse suites built on stilts. 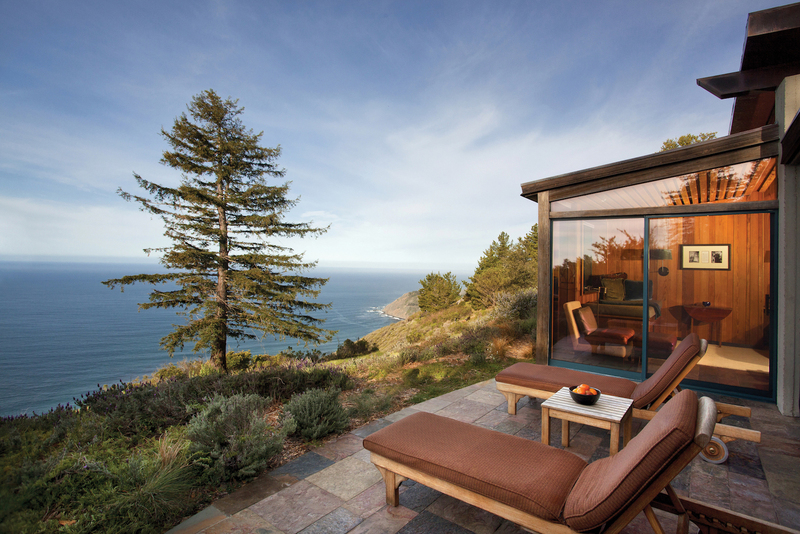 Last year, the legendary Big Sur property reopened following a multimillion-dollar renovation. The updated Ventana Big Sur now features updated guest rooms, Spa Alila, and a series of green initiatives. But perhaps the most exciting amenity of the remodeled resort is a luxury glampsite complete with daily housekeeping, heated blankets, and bath house. For a more low-key and affordable stay, the Big Sur River Inn offers lodging farther north, on the banks of the Big Sur River. Opened in 1934 as the first hotel in the area, this property is steeped in tradition and nostalgia, and draws generations back year after year to its outdoor pool, riverfront restaurant, and waterfront Adirondack chairs. Located on the side of Highway 1 and surrounded by forestry and campgrounds, visitors are ideally positioned to explore Big Sur’s unspoiled natural landscape. There’s a campground in Big Sur for every style and comfort level, ranging from the remote, inland Bottchers Gap Campground to the Fernwood Resort & Campground, a full-service property with cabins, tent camping, and an onsite bar and grill. Though many campsites experienced closures following the fires and mudslides, all sites north of the Pfeiffer Canyon Bridge have reopened, including Andrew Molera State Park, Point Lobos State Reserve, and most of Pfeiffer Big Sur State Park. The site of a classic Big Sur residence first built in 1936, Big Sur Bakery feels like home and treats all who come through the door like family. What you can’t get at home? Wood-fired pizzas, homemade breads, and fresh pastries and desserts from La Brea Bakery and Campanile vet Michelle Rizzolo. Next door to each other and from the same owner, these two local watering holes draw a mix of tourists and locals seeking craft beer, laid-back vibes, and good conversation. The Taphouse pours a rotating list of beers on tap, and serves all the classics bottled or in cans, as well as offers a menu of tacos, hot wings, and other pub favorites. The Deli serves up sandwiches including a Campania Caprese, Cuban Pork, and Southwest Chicken. A fixture of the local community, the Taphouse is the namesake for Taphouse Trail, a route constructed by locals to bypass the Pfeiffer Canyon Bridge after its collapse; the Big Sur Deli and Taphouse were two of the only businesses in town to remain open after the mudslide and helped sustain the community during the rebuild. The breathtaking vistas continue at Nepenthe, Big Sur’s renowned restaurant along Highway 1. Nepenthe serves up house favorites—including the Famous Ambrosiaburger and Steak Frites—for lunch and dinner, while Cafe Kevah is open for brunch, coffee, and pastries on the patio. The site is also home to The Phoenix Shop, a local shop specializing in unique Big Sur souvenirs including art prints, homewares, and clothing. Post Ranch Inn’s signature restaurant isn’t your standard hotel dining concept—Sierra Mar is an award-winning restaurant known for its dreamy setting built into the Big Sur cliffs. With floor-to-ceiling windows overlooking the rugged coastline, Sierra Mar is the best spot in town to take in a sunset over the Pacific Ocean—or to feel like you’re floating in the clouds when the fog rolls in. But the draw to Sierra Mar isn’t just scenic—the restaurant offers breakfast and lunch menus highlighting local ingredients, as well as a four-course prix-fixe dinner menu that changes daily. Between the location inside a converted water tank, the Chagall hung on the walls, and the views from the rooftop cafe, it’s hard to decide what is most special about the Big Sur Coast Gallery and Cafe. The dual-concept business offers sculptures, paintings, and jewelry downstairs, and beer and paninis upstairs, where a large patio overlooks the Pacific Ocean. With a view of the scenic curves in Highway 1, the gallery cafe is especially popular amongst road trippers on their way into central Big Sur. 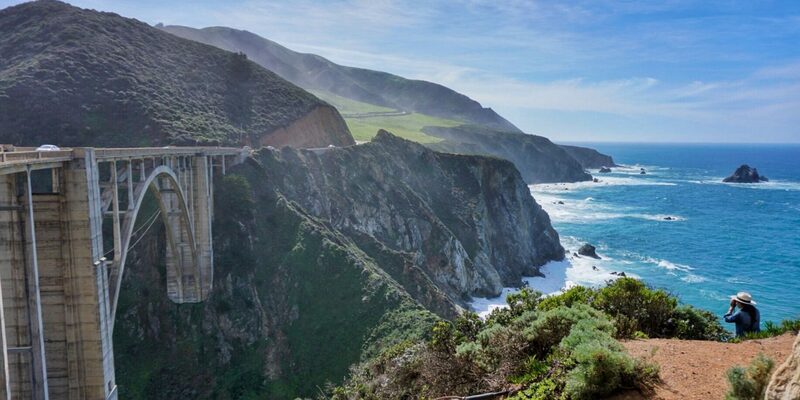 North of Big Sur in Monterey County, visitors can take in some of the best sights in California from one of the most scenic routes in the world. 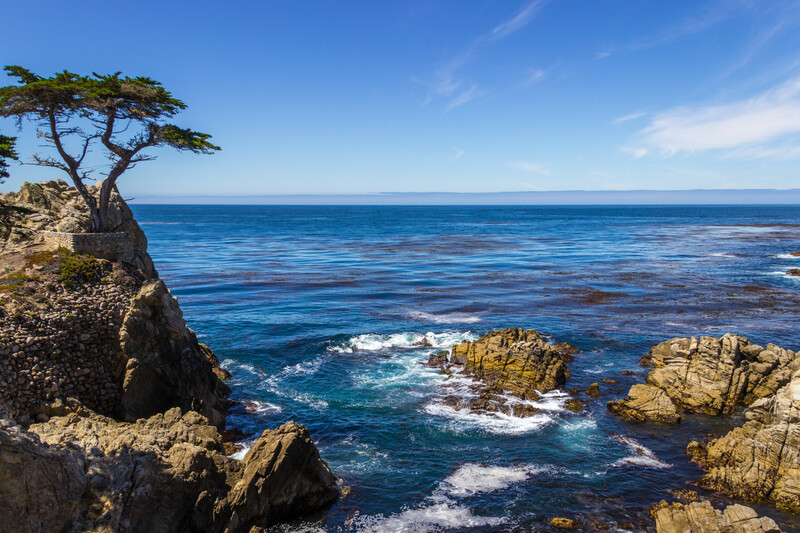 The 17-mile drive traverses Highway 1 between Pebble Beach and Pacific Grove, passing notable sites including the Lone Cypress tree, Spanish Bay, and Bird Rock. Stop off for lunch at the Inn at Spanish Bay, to play a round of golf at The Links or Spyglass Hill, and to take in the views from the many lookout points before heading back down the coast to Big Sur. From Big Little Lies to Big Sur postcards, the Bixby Bridge is the most recognized (and photographed) attraction along this stretch of California coastline. About a half-hour’s drive north of Big Sur on Highway 1, the concrete arch bridge overlooks blue waters and green hills, and attracts visitors from all over the world hoping to get an Instagram-worthy shot of this stunning architectural landmark. If there’s one must-see natural feature in Big Sur, it’s this stunning, 80-foot waterfall. 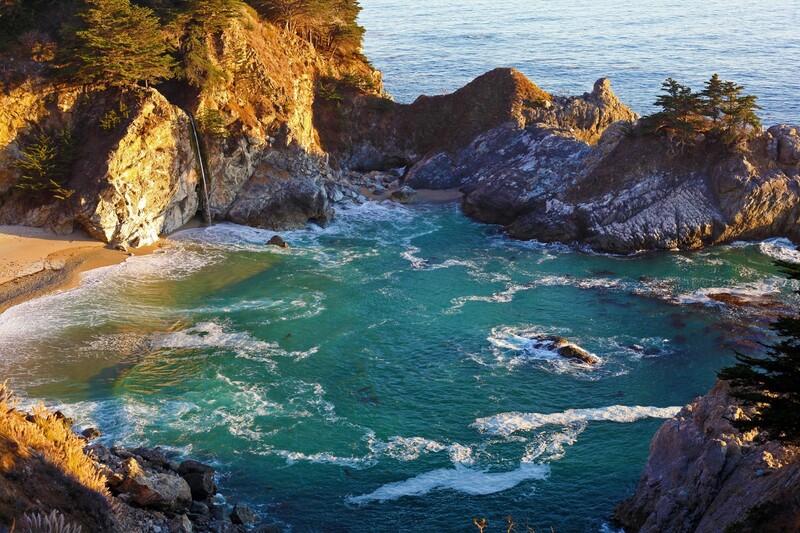 McWay Falls is located within the Julia Pfeiffer Burns State Park and is just one of two such waterfalls in California that run directly into the ocean; in this case, the falls are positioned within a secluded cove about a half-mile off Highway 1. The trail is easily accessed from the parking lot and offers additional hiking options that venture deeper into the picturesque state park. Purple sands, teal waves, and golden rock formations make this Big Sur beach one of the most beautiful in the country. Located north of the main section of Big Sur off a small side road and down multiple flights of stairs, the secluded location helps keep crowds at bay; visiting feels a bit like you’re in on a secret. Bring a blanket and picnic, and spend the afternoon splashing in the tide, laying out with a book, and taking photos of the iconic arch rock—though we’ll warn you, no photos can do this beach justice.